Mind-body as a dualism coincides with Plato's "Ideas" or “Forms” as pure form, with an ontology different from that of matter. The immaterial Forms, seen by the intellect (nous), allow us to understand the world. On the other hand, mind-body as a monism can picture both sides of the mind-body distinction as pure physicalism, since information embodied in matter corresponds to a mere reorganization of the matter. This was Aristotle's more practical view. For him, Plato's Ideas were mere abstractions generalized from many existent particulars. Form without matter is empty, matter without form is inconceivable, unimaginable. In De Anima (On the Soul, Peri Psyches), Book III, Parts 4 and 5, perhaps the most controversial and confusing part of his entire corpus, Aristotle says that the soul (psyche) or mind is immaterial. He was right. For Aristotle, Intellect (nous) is that part of the soul whose active thinking gives it a causal (aitia) power (dynamis) over the material (hyle) body (soma). This claim appears to anticipate the mind-body problem of René Descartes, how exactly does an immaterial thing (substance) or a property exert a causal force on the material body? 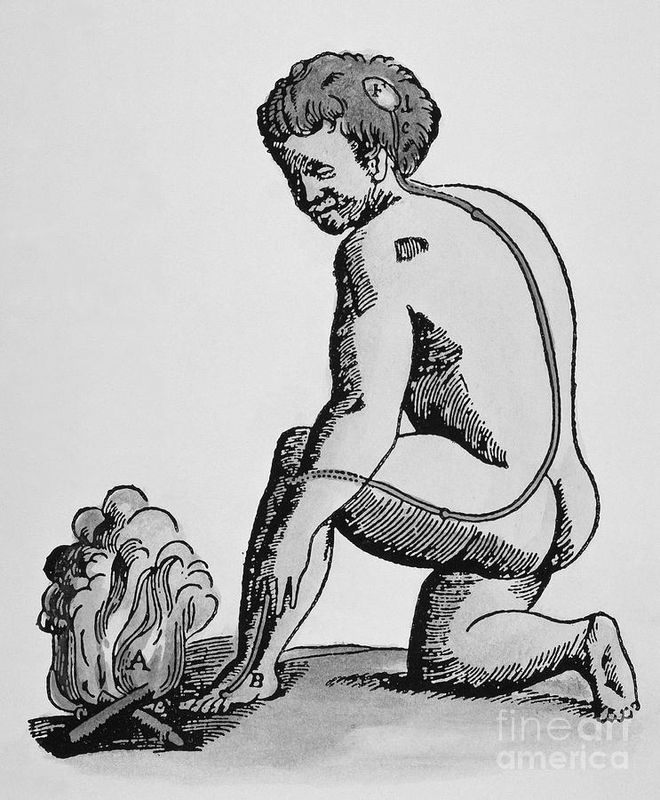 Descartes' illustration of the reflex path from a foot feeling pain from a fire (A), up a nerve to a gland in the mind and back down to pull back the foot (B). It is important to note that Descartes made the mind the locus of undetermined freedom. For him, the body is a deterministic mechanical system of tiny fibres causing movements in the brain (the afferent sensations), which then can pull on other fibres to activate the muscles (the efferent nerve impulses). This is the basis of stimulus and response theory in modern physiology (reflexology). It is also the basis behind connectionist theories of mind. An appropriate neural network (with all the necessary logical connections) need only connect the afferent to the efferent signals. No thinking mind is needed for animals. Descartes' suggestion that animals are machines included the notion that man too is in part a machine - the human body obeys deterministic causal laws. But for Descartes man also has a soul or spirit that is exempt from determinism and thus from what is known today as "causal closure." But how, we must ask, can the mind both cause something physical to happen and yet itself be acausal, exempt from causal chains?